He was arrested last year when dozens of dead greyhounds were discovered in his kennel at Ebro Greyhound Park. According to state officials, the dogs died from starvation, dehydration, or asphyxia. According to news reports, former greyhound trainer Ronnie Williams plead guilty this morning to 39 counts of animal cruelty. He was arrested last year when dozens of dead greyhounds were discovered in his kennel at Ebro Greyhound Park. According to state officials, the dogs died from starvation, dehydration, or asphyxia. On the left, a Greyhound's live "between races." Williams was sentenced to five years in prison for each charge. However the sentences will run concurrently. He has already spent a year in jail while waiting trial, and will not receive credit for that time served. There is no doubt that Williams should have received a stiffer penalty for his heinous acts. Sadly, it is common for animal abusers to receive relatively light sentences. 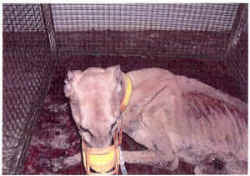 Today's plea is the end of a sad story in which dozens of greyhounds suffered and died. Today, my thoughts are with those dogs.